Welcome to our website, dedicated to finding the best beard trimmers and other facial hair shapers on the market. We all know that going clean shaven hasn’t been fashionable for years! Facial hair is one of the ways us guys have to alter our looks and if facial hair is good enough for the likes of David Beckham and Brad Pitt then surely it is good enough for us guys, right? As facial hair has become more and more popular, manufacturers have created loads of great products to help us get our face fur looking and feeling exactly how we want it to. Beard trimmers are quite popular now, and you can buy them from your local drug store, supermarket or electronics store with a huge amount of variation in price, brand and quality. Buying a beard trimmer can be a tough experience, knowing which manufacturers to trust, which features you are looking for and how much money you need to part with to get the quality you’re looking for. How Much is a Beard Trimmer? Price is a big part of anybody’s decision to buy, and it is key to know how much money you can expect to part with for a decent beard trimmer. A quick look on an online retailer (one of the best places to buy your product, with a huge selection) will tell us that the price can vary from the cheaper end of the market at around $15 (extremely cheap and basic models) all the way up to around $100 (hopefully for 100 bucks you’ll get a trimmer that can do your laundry too!) As you’ll see from the models we mention below, in general, the more you spend, the more features and attachments you get. The battery life plays such a big part in the decision to buy and use a beard trimmer, whether you are using it for travel or not you’ll want to know that it can hold up to the test when using it not plugged into the wall, and battery lives have traditionally been pretty poor. Modern technology, however, has brought us Lithium Ion, a technology that has really revolutionized a lot of electronic equipment, including trimmers, some of them need just an hour of charge now to provide almost an hour of trimming (that’s a lot of trimming, if it takes you 5 minutes you can get 12 trims without having to charge again). This is of course energy saving and also great for relying on when you travel, even if it is just for the weekend. Control over your battery life is also something we now get a lot more of, some trimmers have a display showing you just how much juice is left in your machine and when you will need to plug it back in to charge. There’s no doubting that this is one way in which they have improved hugely. I have selected the Remington MB4040 as one of the best beard trimmer models for a few reasons. It is a reasonable price and comes with loads of good features as well as being a name you can trust in Remington, who offer loads of great hair products for both men and women. This Remington model is really impressive. It’s titanium coated blades claim to be both self-sharpening and even self-oiling for the best in comfort as well as being long lasting and durable. 9 Different length settings gives loads of choice for just how much designer stubble or full-on beard you’re looking for and room to experiment with your facial hair. Cordless control means you don’t have to be next to a power point for this trimmer to work. Perfect for travel and easy for using around the house. Perhaps the coolest feature of the machine is the fact that it has three different attachable heads with different teeth and designs for goatee, stubble or full beards for the most natural and stylish look possible. Could well be the best beard trimmer on the market, or at least one of them. Philips offer a huge amount of electrical equipment, but some of their beard trimmers come with a brilliant unique selling point, a vacuum. One of the main problems when it comes to trimming your facial hair is the mess it makes, there are few things more annoying than flecks of hair all over your sink or bathroom floor, so how do we get around the problem? Well the Norelco QT4050 has done exactly that, with a built in vacuum! It catches the hairs before they have the chance to drop, ensuring minimal mess and maximum ease when it comes to trimming. This Philips Stubble Trimmer doesn’t just come with my recommendation based on its ability to hoover! 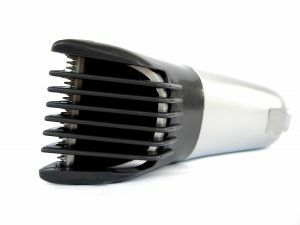 This is a high quality trimmer with lots of features including an incredible 18 length settings so you can make sure your beard is the perfect shape and length at all times. It can be used both with and without cord and has a great battery life, perfect for traveling and shaving on the go, and has a convenient light that comes on when the battery is low and it needs a bit of a boost. The design of the ‘business end’ of this beard trimmer brilliantly follows the contour of your face for the most comfortable and up close shave you can possibly get. Comes with a very generous 2 year warranty to cover you if anything should go wrong. You can’t lose with this exceptional beard trimmer model. I couldn’t not mention this beard trimmer on the home page of our website. Wahl have a good range, but this is unbelievably affordable and has so many features and added extras for a ridiculous price, currently just $10 on Amazon. An eleven piece kit offers glide combs, mustache comb, a blade guard, blade oil, and a storage base and even comes with a bonus ear, brow and nose trimmer, who can complain with all of these exceptional features at a price that even suits the smallest of budgets? This even does the job as well as some models three or four times the size. Even comes with a 2 year warranty so no need to worry about the build quality either. If you’re looking for an awesome guide on how to use a beard trimmer, the best bet is to check out something visual, we can’t exactly write thorough instructions on here and expect you to be able to follow without actually seeing what’s going on, which is why we’ve included this link to a videojug video on Youtube showing you the exact steps of how to effectively use your newly found best beard trimmer.